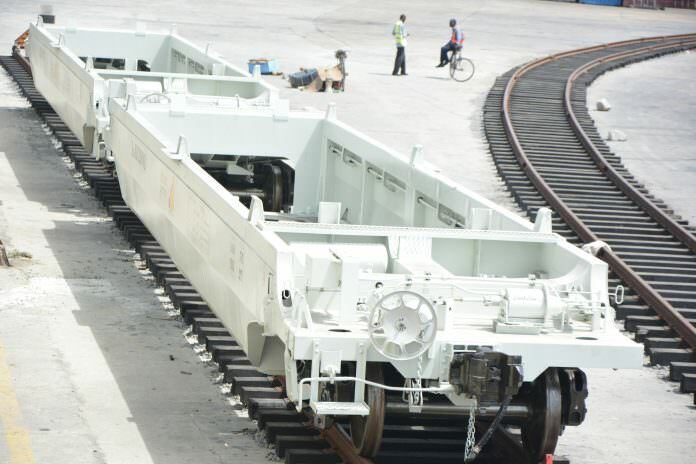 Kenya Railways has received 18 freight locomotives and 60 wagons to run cargo services on its new standard gauge railway. Freight operations are yet to begin on the railway line – which opened in May – but it has received all of the necessary locomotives, with services set to begin by the end of 2017. So far 940 of 1,620 wagons have been delivered. An inland container depot is being built at Embakasi, which will hold freight cleared from the Port of Mombasa. It is due to be complete in September. The rolling stock was delivered by sea on the Da Qing Xia vessel. The offloading ceremony ceremony took place on July 15 to 17 at the Port of Mombasa. The managing director of Kenya Railway Corporation Atanas Maina said: “We have been receiving the locomotives and other rolling stock over the course of the year. “Today we have received additional freight locomotives and more importantly the X2k series wagons. “These wagons will allow for double stacking of containers during transportation.